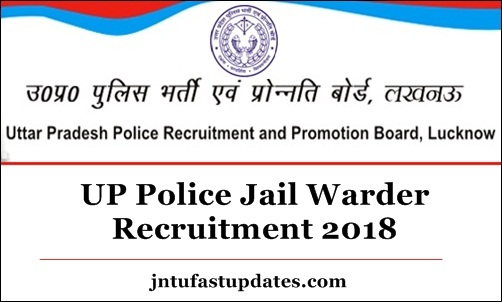 UP Police Jail Warder Recruitment Notification 2018: Uttar Pradesh Police Recruitment and Promotion Board has released a recruitment notification for 3638 Jail Warder (Male/Female) posts. Candidates waiting for the UP Jail Warder Notification 2018 can apply through online at uppbpb.gov.in. Aspirants can download UP Police Jail Warder Notification 2018 from the same portal and observe the details of eligibility criteria, application process, selection process, important dates and many other details from the notification. Go through the UP Police Jail Warder Notification clearly to avoid all sorts of doubts. Aspirants can refer this article for brief details about the UP Jail Warder Recruitment 2018. Uttar Pradesh Police Recruitment and Promotion Board, Lucknow is the government organization that works for the recruitment of manpower for the police department of UP state. This department releases various job notifications annually to hire the suitable aspirants into various designations. This year the UPPRPB announced 3638 Jail Warder for male and female candidates. Interested hopefuls can apply for UP Jail Warder Posts from official site. Candidates must have the suitable physical standards and educational qualification to apply for jail warder jobs in Uttar Pradesh. Candidates eager to apply for UP Jail Warder jobs can check more details from the following. Candidates willing to apply for Jail Warder Vacancies must have the minimum educational qualification of class 12th pass from any of the recognized board. Candidates belongs to reservation category will get age relaxation as per norms. Age Relaxation of 3 years for OBC Candidates and 5 years for SC/ST candidates will be applicable. Candidates will have to qualify in all the rounds of selection process to get the job as Jail Warder. The selection process includes the following rounds. Candidates shortlisted in the selection process will be appointed in jail warder posts. Appointed candidates will get a good pay scale of Rs. 21,700 to Rs. 69,100 per month. Applicants have to pay the fee of Rs 400 (all categories) through online using any debit/credit cards. How to Apply UP Police Jail Warder Posts 2018 Online? Interested and eligible aspirants can proceed applying through online @ uppbpb.gov.in. The UP Jail Warder Notification, Online application form will be accessible on the same portal. Aspirants can go through the notification once and apply for jail warder posts during the application dates. While applying candidates need to enclose the scanned copies of required documents, signature, and photograph as well. Hence be prepared by scanning all the required documents. Also, applicants have to pay the requisite application fee to apply for UP Jail Warder Posts. 1.2 How to Apply UP Police Jail Warder Posts 2018 Online?